The Lawo VSM control system brings together all the requirements for Sky Racing’s technical devices and operators. Televising more than 80,000 races each year to millions of viewers in Australia and around the globe, Sky Racing produces multi-venue, multi-channel broadcasts of Australian thoroughbred, harness and greyhound racing events. It is distributed to more than 5,000 outlets across Australia, and into 51 countries around the world via satellite, cable, mobile and the Internet. The Lawo VSM control system brings together all the requirements for Sky Racing. The company said its “everything under one roof” philosophy unites technical devices and operators. User panels and interfaces can be configured to meet the requirements of different workflows and applications, while the whole system is under redundant control. Initially Sky Racing opted for two medium sized VSM systems with 6400 x 6400 crosspoints, a modest amount of control ports for Dante Matrix control, DMX control and control of their video routers in Sydney and Melbourne. In addition to the control ports, each system has storage groups enabled to create, load and save presets including labels, cross points, GPO states, parameters and panel layouts using mimic buttons. Sky Racing has deployed two medium sized VSM systems with 6400 x 6400 crosspoints, a modest amount of control ports for Dante Matrix control, DMX control and control of their video routers in its Sydney and Melbourne locations. Also enabled are vsmGadgets, which allow Sky Racing to control up to 500 third party parameters. 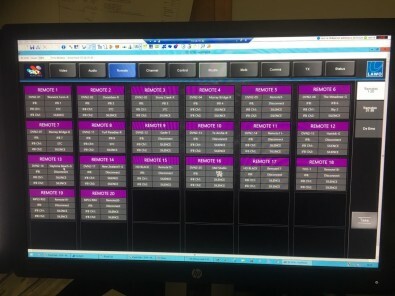 Each system has 18 virtual vsmPanels, which were custom configured to meet Sky Racing unique workflow requirements. In its Sydney Frenchs Forest facility, Sky Racing uses VSM to unify all legacy systems while preparing for the migration to IP operations. This will allow for seamless transition with the operations teams not affected by technological changes. Over the years, different routing solutions supplied by different manufacturers had to be united under one overarching control layer to unify operational tasks. Benefits also include centralized labeling of all incoming racetracks across both video labels within the control rooms, but also the IFB and tech talkback keys on RTS talkback panels. A second system is also deployed in Sky Racing’s new Tabcorp office in Melbourne, where the Lawo VSM system is managing the routing of the Race Day Control Room. This is comprised of 18 workstations, each with 3 Genelec 8010APM speakers having Dante networked audio routed into them via the VSM virtual control panels. All 54 Genelec speakers were supplied by system integrator Professional Audio & Television (PAT), with a Dante monitoring bridge. PAT also supplied VSM configuration services and training for Sky Racing's engineering staff.